Collection of material including transcripts of letters between C/7259 Pte Albert E French and his father and sister covering his service in the Great War from when he enlisted in 1915 to his death on 15th June 1916; official letters and forms relating to his death, will and Victory Medal. There are a number of photographs taken both during and after the War. 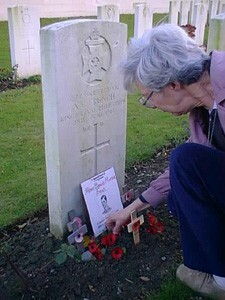 The post war photographs include a ceremony at the Royal Berkshire Cemetary Extension and shots of his grave. There are also photographs of Wolverton where he and his family lived. The collection also includes scripts, photos and songs used when researching and performing the Radio and Stage plays ‘Your Loving Brother Bertie’ and ‘He Shouldn’t Have Been There. Should He?’. Albert Edward Mortlock French was born in New Bradwell on 22 June 1899 and was an apprentice engineer at the Wolverton Railway Works when he left home to enlist in The Kings Royal Rifle Corps in 1915 aged just 16 years old. Albert lived with his sister Mabel and two brothers Will and George, in Young Street, Wolverton, Buckinghamshire. Their mother had died and their father employed an elderly spinster, Miss Gates, to look after them. Albert and his siblings referred to her as ‘Aunt’. Albert wrote home regularly to his sister Mabel, called ‘May’, and the rest of the family. 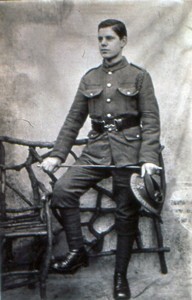 Albert left for France in May 1916 and was killed just six weeks later on 15 June 1916, a week before his 17th birthday. 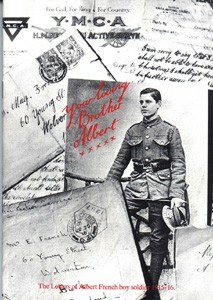 Collection of letters to and from Albert French and his family from the time Albert enlisted in 1915 until his death in 1916 in France. There are also letters from Chaplain Mayne and Captain Pennell to Albert’s father regarding his death and a transcript of Albert’s will.